Is winning the Filipino vote important in putting Filipinos into government—musings from the experienced legistlator. 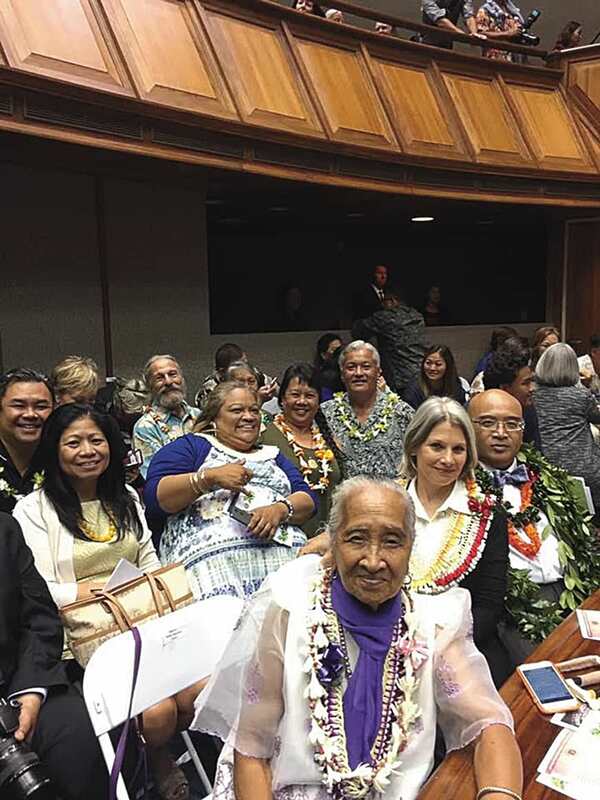 Sen. Gilbert Keith-Agaran with spouse Kallie Keith-Agaran, mother Lydia Coloma, sister Velma Coloma and other family and guests on the Senate Floor for Opening Day of the 29th legislature (2017 regular session). I’m the only Filipino legislator in the Maui delegation. In the just completed 29th Legislature, there weren’t that many of us statewide. Of the twenty-five Senators, Donovan DelaCruz (Wahiaw&#257;), Brickwood Galuteria (Waik&#299;k&#299;-Kaka‘ako), Donna Mercado Kim (Kalihi Valley, Moanalua), Will Espero (Ewa Beach), Lorraine Inouye (Kona-Kohala) and I make up a caucus of six. Not many but we out-number the Filipinos in the fifty-one member House of Representatives where there are five: Ty Cullen (Kunia), Henry Aquino (Waipah&#363;), Della Au Belatti (Makiki), Joy San Buenaventura (Puna) and Romy Cachola (Kalihi). Four Filipino legislative caucus members on the final day of the legislative session. 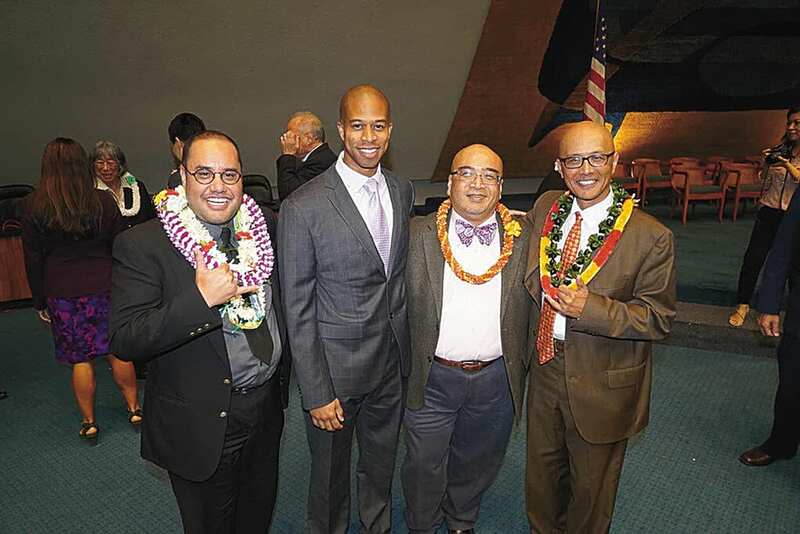 There are some with Filipino spouses or significant others: Justin Woodson (Kahului), John Mizuno (Kalihi) and Kaniela Ing (South Maui). Some of us represent areas where you expect to find sizable Filipinos— our homelands of Kalihi, Waipah&#363;, Ewa Beach and Kahului. Other Filipino holdings are sending non-Filipinos to represent them. Contrary to what some critics of Hawai‘i politics would argue, Valley Isle voters have been fairly selective in returning legislators to office. 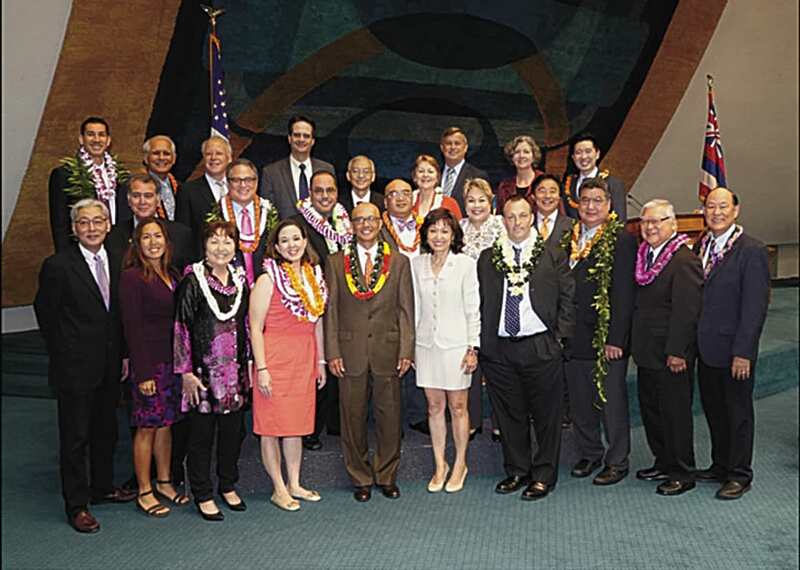 For Maui, with only nine Senators and Representatives in the seventy-six member legislature, stability has been a sporadic occurrence. For every Joe Souki who spends decades in the House, there are the single terms of Kam Tanaka, George Fontaine and Kika Butkowski. The members of the State Senate at the end of the 2018 Legislative Session include six Filipinos: Will Espero, Donna Mercado Kim, Brickwood Galuteria, Donovan Dela Cruz, Gil S.C. Keith-Agaran and Lorraine Inouye. In 2006, Maui County’s legislative delegation included Joe Souki (House Dist. 8), Bob Nakasone (House Dist. 9), Tanaka (House Dist. 10), Chris Halford (House Dist. 11), Kyle Yamashita (House Dist. 12), D. Mele Carroll (House Dist. 13), Shan Tsutsui (Sen. Dist. 4), J. Kalani English (Sen. Dist. 6 ) and Roz Baker (Sen. Dist. 5). After the General Election, Tsutsui won a rematch with former Sen. Jan Yagi Buen while Tanaka lost to Angus McKelvey. Tanaka himself in 2004 ousted incumbent Brian Blundell while Yamashita won a rematch for the Upcountry seat with incumbent Kika Butkowski (in doing so, Yamashita patented a Haleakal&#257; Highway sign waving technique that has been imitated but never successfully copied). 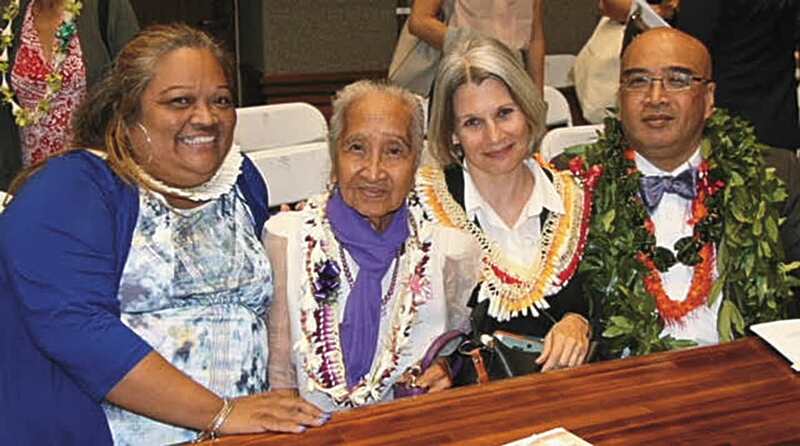 Carroll was appointed to the East Maui-Molokai-L&#257;na‘i seat to replace Sol Kaho‘ohalahala who resigned to work for the Kaho‘olawe Island Reserve Commission in 2005. Sen. Keith-Agaran and family on Opening Day of the 2017 Legislative Regular Session. The delegation remained intact in the 2008 election. However, Nakasone sadly passed away after winning re-election and Gov. Linda Lingle appointed me to his Kahului House seat. 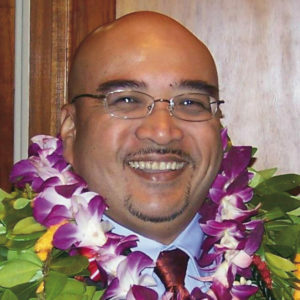 In 2010, Bertram lost a rematch to George Fontaine for the South Maui seat. The 2012 election saw another change in K&#299;hei when Kaniela Ing ousted George Fontaine. 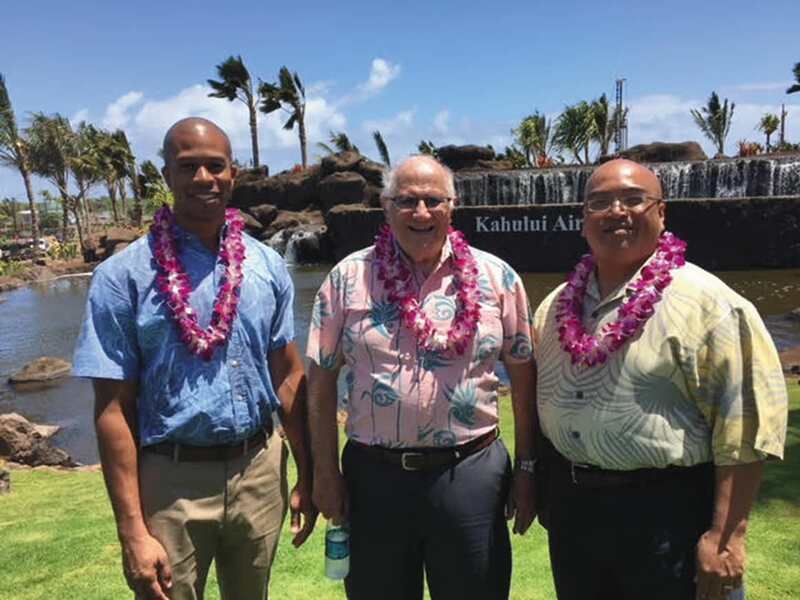 Rep. Justin Woodson (Kahului), former Rep. Joseph Souki (Wailuku) and Sen. Gil Keith-Agaran (Central Maui) at the opening of the new Kahului Airport entry road. Later that year, U.S. Senator Daniel K. Inouye passed. Shan Tsutsui moved to the Lt. Governor’s office and Gov. Abercrombie appointed me to the State Senate in his place. The Governor also picked Justin Woodson to take my seat in the House. Another change happened when Carroll succumbed to cancer in 2015. Gov. David Ige appointed Lynn DeCoite to the canoe district. During the ten years I’ve been in the legislature, one thing has not changed. I’ve been the only Filipino member of the delegation. Based on our population, people would expect more. But unlike an election for County Council or for Mayor where all voters can cast a vote for any of the offices on the ballot, legislative seats are decided by the registered voters who live in a particular district. Kahului people vote for District 9, Wailuku people for District 8, and so on. But even when voting County wide, Filipinos have not filled many Council seats either. 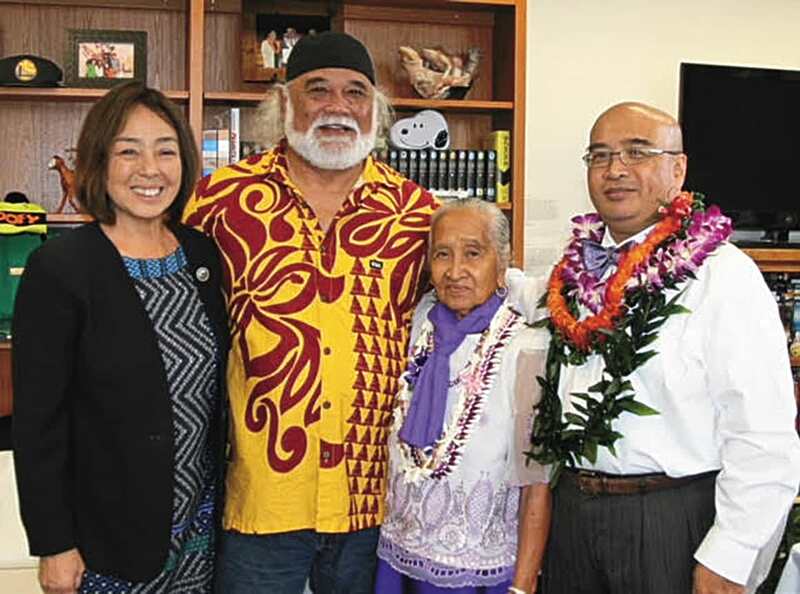 Maui Councilmembers Yuki Lei Sugimura (Upcountry) and Alika Atay (Wailuku) with Sen. Gil Keith-Agaran and his mother Lydia Coloma at the Opening of the 2017 Legislative Regular Session. As long as I remember, there have been just a handful of Filipinos who’ve served on the Maui County Council. Pablo Caldito. At one time, Vince Bagoyo and Rick Medina served at the same time, and in more recent times, Danny Mateo and Joe Pontanilla. With Don Guzman deciding to run for Mayor, Alika Atay may be the only Filipino on the Council, provided he wins re-election. Unless Kanamu Balinbin or Rick Nava pulls off an upset in West Maui, Atay may be the only one on the Eighth Floor saying Mabuhay. There have been Filipino candidates throughout the last twelve years. Some have appealed more directly to their fellow Filipinos. Others have campaigned more broadly. The latter have generally been more successful and that makes sense. Filipinos may make up a considerable proportion of various neighborhoods but not everyone is registered to vote or does vote. Why else would some candidates dismiss the Filipino population as expendable since they can always move back to the Philippines. Since Republicans and other smaller political parties have a challenge to even field candidates, legislative seats are usually settled in the Democratic Primary Election. Even when there is a General Election, the Democratic Nominee is usually favored. 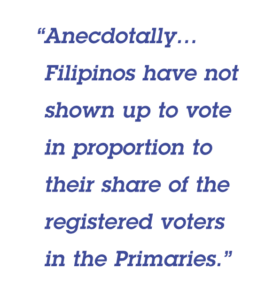 Anecdotally, for whatever reason, Filipinos have not shown up to vote in proportion to their share of the registered voters in the Primaries. People suggest that Filipinos work on weekends and the Primary is always held on a Saturday. However, the observation has persisted even as the legislature made absentee voting easier over the years. Hawai‘i is among the states that allows “no excuse” absentee voting (vote by mail used to be reserved for people who would be out-of-state on Election Day). The State also began to allow early Walk In voting in addition to Absentee Mail and showing up at the polls. In 2016, people could show up at an Absentee Walk site and take advantage of same day registration and voting. By all accounts, Absentee Mail has gained in popularity but it’s believed that Filipino turnout continues to lag. 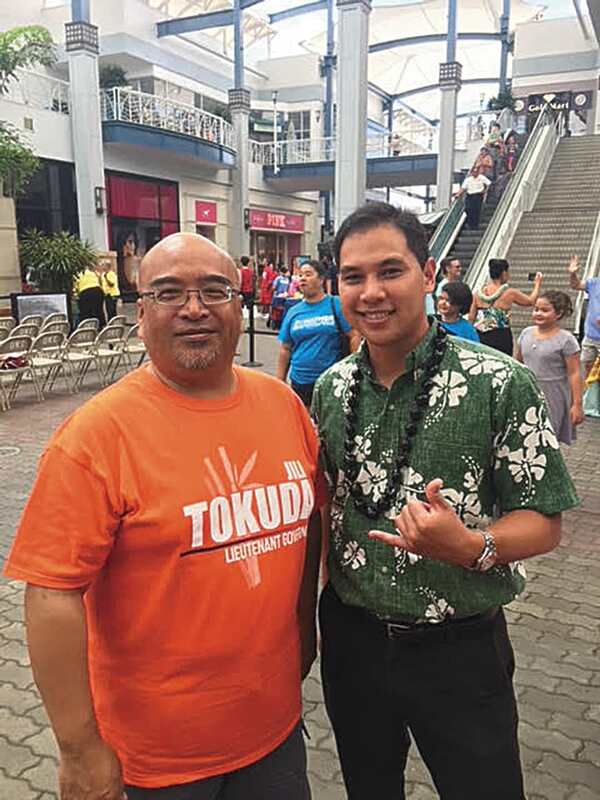 Sen. Gil Keith-Agaran and candidate Kauanoe Batangan at Ka‘ahumanu Shopping Center candidates event earlier this summer. This year, the following Filipinos put their hats in the ring: Don Guzman for Maui Mayor, Kauanoe Batangan against Woodson in Kahului, and Rick Nava and Kanamu Balinbin for the West Maui Council seat. With the Primary completed, some losing candidates who were relying on their Filipino heritage or surname will wonder whether additional effort to get out the Filipino vote would have made a difference. But that assumes that Filipinos will always vote the Filipino. Given the Civil War in the Mayor’s Race, I would think that has been laid to rest.